Dr Christina founded the laser service division of Beaver Valley Foot Clinic and then Body Beautiful Laser Medi-Spa( for the rest of the Body) and the on the concept of putting cutting edge technology in the hands of a highly trained staff in order to provide the best medical spa services in the Greater Pittsburgh Area—or anywhere else. Our equipment is second to none and our laser technicians have over 40 years of combined experience. Additionally, our prices are often about half of what you’d pay at a plastic surgeon’s or dermatologist’s office, and we believe that if you’re going elsewhere then you’re most likely paying too much. We also strive to offer our patients the utmost in convenience. Some of our 9 Body Beautiful sister locations include Cranberry, Monroeville, Hermitage, Grove City, Bethel Park, New Wilmington, and even downtown Pittsburgh. We also have convenient weekend and evening appointments available. Many of our facilities have recently been remodeled, and we insist on maintaining the most sanitary conditions and the utmost cleanliness. Clients can call in for an appointment or register online, and many times we can fit walk-ins to our schedule for consultations or test spots. Everyone must have a consultation before treatment begins. This gets everyone on the same page in terms of expectations, unlikely but possible side effects, and stresses the importance of aftercare before the procedure has even begun. After your consultation, treatment can begin that visit. 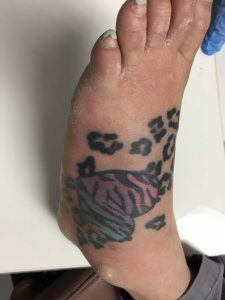 Laser for feet and legs – whether its unsightly toenail fungus, hairy toes and legs, a regrettable tattoo, painful heel or ball of foot, or an ugly spreadable wart on your foot… We have the Best Laser in Pittsburgh to fix your problem! 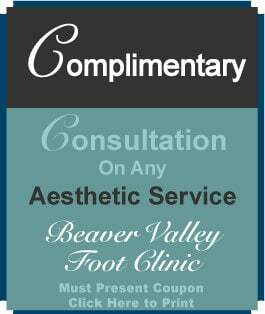 Beaver Valley Foot Clinic & Body Beautiful Laser Medi-Spa (our sister company) specialize in cosmetic services in 10 locations in Western Pennsylvania including Pittsburgh and Cranberry Twp. 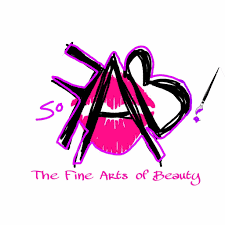 Call Body Beautiful 724-987-3221 for an appointment for Hair Removal on the rest of your body! Remove unsightly hair from toes, legs, neck, chest, back, underarms, lip, chin, ears, bikini line and Brazilian! Before and after photos of toenail fungus treated with lasers. We have 4 Foot Clinics with Laser Treatment in Beaver, Butler, and Allegheny Counties and 10 Body Beautiful locations with lasers for toenail fungus in Pittsburgh for your convenience! Consult with a Podiatrist first at 4 Locations. We have 9 additional locations for your convenience through our sister company. After your treatment show off your toes with Danipro Antifungal Toenail Polish to inhibit the regrowth of fungus in toenails. See our Product page for many other products to treat your feet. Kid Friendly Lasers to Treat Plantar’s Warts! Does walking on your warts even in your shoes hurt because the verucca are so thick? Do you hide your feet in the sand at the beach, or wear your hot shoes in the summer so your plantars warts don’t show?? Are you interested in a simple easy way to get rid of your foot warts that isn’t painful? Safe affordable laser treatment of plantars warts that really works! Beaver Valley Foot Clinic has the latest laser technology available and we bring it to you! We can treat plantar warts, fungus toenails, chronic muscle and joint pain and more. We are about OPTIONS! Especially for difficult to treat conditions like plantar fasciitis, plantar warts, and toenail fungus. We have options to fit your health considerations and also every budget! And we offer these choices and alternative treatments through our Board Certified Podiatrist near me. Call for the podiatrist office in your area with this technology! 878-313-FEET (3338) Beaver Valley Foot Clinic. 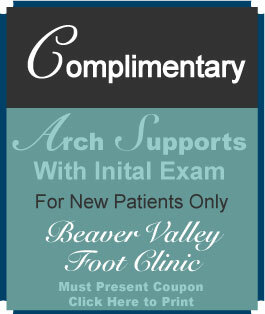 Advanced Laser Systems @ Beaver Valley Foot Clinic! Treat heel pain and inflammation with K-Laser technology. 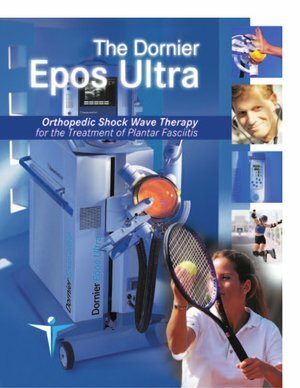 Painful tendonitis, ball of foot pain, arthritis can all benefit by laser therapy. Every day advances are made in cold laser therapies. see what cutting edge technology is available at our foot clinics in Beaver, Cranberry Twp, Moon township and Ambridge Foot Clinics. Our “Healing Power of Light, lasers options are very versatile, have various settings designed to penetrate different tissue depths and types. Protocols consist of about 4-10 treatments and maintenance as needed. You may experience pain relief really quickly – its very get all the benefit from the biostimulatory properties by following through with full course of sessions for optimal care. The treatment is painless, many patients report a warm, sensational feeling during treatment. The highly advanced system has greatly reduced the size in typical lasers that have come before it. Sessions typically last 12-20 minutes. 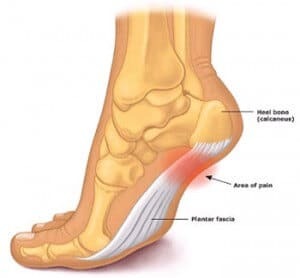 Foot pain – Shinsplints, Plantar Fasciitis, etc. Laser Treatment for varicose veins and spider veins, Pittsburgh area locations. A Simple Safe Way to Feel Good About Your Legs Again. Are you concerned that you are no longer able to hide the Vericose Veins & Spider Veins that have started to appear on your legs? Are you afraid your leg veins will look like your parentsvaricose leg veins? Would you like a simple, safe vein treatment, covered by insurance, to feel good about your legs again? Introducing ESWT for plantar fasciitis! For people that have tried and failed all Conservative therapy and for whom surgery is the only option left…Try ESWT! Any other questions? Would you like to schedule SMT to come to your office? Not feeling that tattoo you got as a teen? 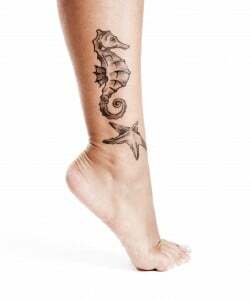 Below the knee foot and ankle tattoos can be removed with laser comfortably at Beaver Valley Foot Clinic 878-313-3338. To have any body part treated with laser tattoo removal call Call Body Beautiful 724-987-3221 for an appt! We are one of very few Pittsburgh tattoo removal clinics with the PICOSURE Laser tattoo removal system which removes more colors in less than half the time! Our equipment is world-class, and our ultimate goal is to help you get rid of your unwanted tattoo in as few treatments as possible. While the laser is shattering the pigment particles which make up the tattoo, it’s important to remember that it’s the body’s immune system which actually removes the degraded pigment. Proper after care is essential. We’ll go over the specific details with you, and you can do your part by staying well hydrated, eating healthy foods, and exercising regularly. Together, over the course of your treatments, we’ll work to clear your unwanted ink as quickly as possible. Tattoo removal using lasers can be quite uncomfortable: many patients report that it feels like hot oil splattering against the skin or compare the feeling of a strong, tight rubber band being snapped against the skin repeatedly. Most modern lasers have on-board cooling systems, which help to get rid of excess heat as it’s formed. This prevents much of the pain before it starts. Local anesthetics such as lidocaine are also often applied topically as ointments or injected into the treatment area prior to the session. Everything we do at Body Beautiful Laser Medi-Spa is supervised by our medical director, Dr. Timothy Kavic, and our laser technicians are some of the most experienced in the business. We’ve also invested in the most state-of-the-art laser systems available, and we’ve truly got a laser for every combination of tattoo color and skin type imaginable. In most cases, we’re going to use a picosecond laser such as the PicoSure. This is an extremely powerful, medical grade laser which delivers trillions of pulses of laser energy per second to the pigment particles which give the tattoo its color. This high pulse rate is important, as it allows very high amounts of energy to be delivered while minimizing any excess heat which could damage surrounding tissue. This rapidly heats these pigment particles, causing them to shatter into small fragments which can be easily removed by the body’s immune system. The tattoo begins to fade, and after a series of treatments it’s gone for good. Our facility has invested in the most advanced equipment available on the market today. We use the PicoSure laser by CynoSure, Inc., which is regarded by many in the industry to be one of the best laser tattoo removal systems in the industry. It’s used in some of the world’s top tattoo removal practices, and achieves excellent results over a very wide variety of skin tones and ink colors. specifically known as a picosecond Q-switched Nd:YAG laser. What this translates into is the ability to penetrate to any necessary depth to remove the widest possible range of ink colors quickly and efficiently. It’s also an adjustable device capable of achieving beams at three of the most effective wavelengths used in laser tattoo removal—532 nm, 694 nm, and 1064 nm. This allows the effective treatment of virtually every type and color of ink in use today by professionals and amateurs alike. For Laser for the rest of the body and for info on Botox, Juvederm, skin tightening and other Cosmetic face and Body Treatment.